Dan, Maggie, Ruby and Titus came to visit us last weekend. We had such a great time! They came up Friday evening and stayed until Saturday evening. 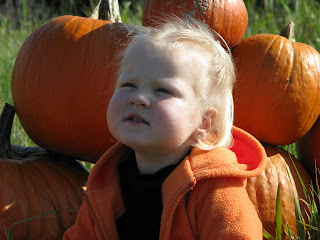 We enjoyed picking apples, cooking apples, going to the pumpkin patch, and going on a bike ride. 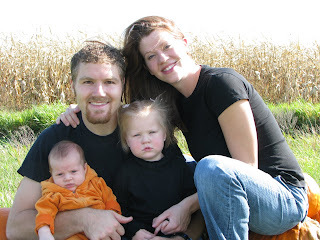 We had some stormy weather a couple days before they came, but God gave us amazing weather while they were here. 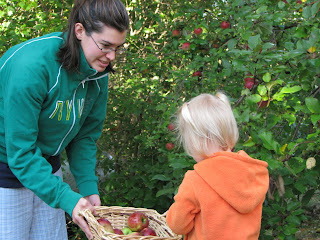 Ruby and I went out in our pajamas to pick apples while Tim cooked pancakes for breakfast. There are a lot of branches so heavy they’re almost to the ground, so Ruby filled my whole basket! 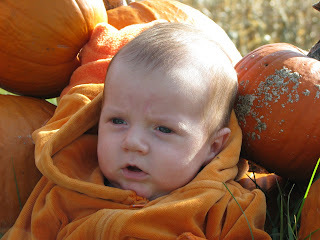 Titus’s first visit to a pumpkin patch. 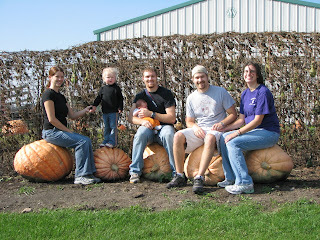 All of us at the pumpkin patch. Look how big those pumpkins are! Yeah, Ruby has grown a lot! Love you too Alex, it’s good to hear from you.